Shitō-ryū (糸東流?) is a form of karate that was founded in 1931 by Kenwa Mabuni (摩文仁 賢和 Mabuni Kenwa?). ﻿Kenwa Mabuni﻿ (Mabuni Kenwa 摩文仁 賢和) was born in Shuri, Okinawa in 1889. 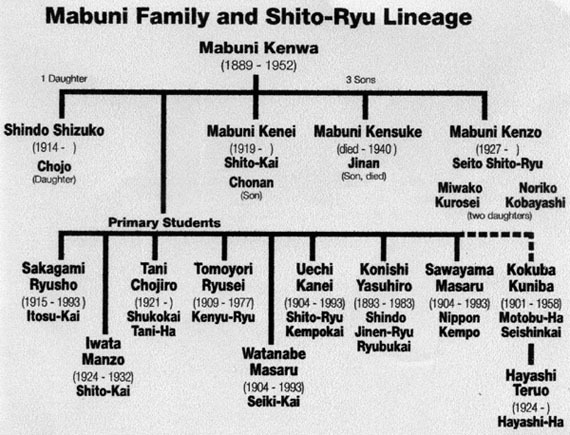 Mabuni was a 17th generation descendant of the famous warrior Oni Ufugusuku Kenyu. Perhaps because of his weak constitution, he began his instruction in his home town in the art of Shuri-te (首里手?) at the age of 13, under the tutelage of the legendary Ankō Itosu (糸州 安恒 Itosu Ankō?) (1831–1915). He trained diligently for several years, learning many kata from this great master. It was Itosu who first developed the Pinan kata, which were most probably derived from the "Kusanku" form. One of his close friends, Chōjun Miyagi (宮城 長順 Miyagi Chōjun?) (co-founder of Gojū-ryū Karate) introduced Mabuni to another great of that period, Kanryō Higaonna (東恩納 寛量 Higaonna Kanryō?). Mabuni began to learn Naha-te (那覇手?) under him. While both Itosu and Higaonna taught a "hard-soft" style of Okinawan "Te", their methods and emphases were quite distinct: the Itosu syllabus included straight and powerful techniques as exemplified in the Naihanchi and Bassai kata; the Higaonna syllabus stressed circular motion and shorter fighting methods as seen in the kata Seipai and Kururunfa. Shitō-ryū focuses on both hard and soft techniques to this day. Although he remained true to the teachings of these two great masters, Mabuni sought instruction from a number of other teachers, including Seishō Arakaki, Tawada Shimboku, Sueyoshi Jino and Wu Xianhui (a Chinese master known as Go-Kenki). In fact, Mabuni was legendary for his encyclopaedic knowledge of kata and their bunkai applications. By the 1920s, he was regarded as the foremost authority on Okinawan kata and their history and was much sought after as a teacher by his contemporaries. There is even some evidence that his expertise was sought out in China, as well as Okinawa and mainland Japan. As a police officer, he taught local law enforcement officers and at the behest of his teacher Itosu, began instruction in the various grammar schools in Shuri and Naha. In an effort to popularize karate in mainland Japan, Mabuni made several trips to Tokyo in 1917 and 1928. Although much that was known as "Te" (Chinese Fist; lit. simply "hand") or karate had been passed down through many generations with jealous secrecy, it was his view that it should be taught to anyone who sought knowledge with honesty and integrity. In fact, many masters of his generation held similar views on the future of Karate: Gichin Funakoshi (founder of Shotokan), another contemporary, had moved to Tokyo in the 1920s to promote his art on the mainland as well. By 1929, Mabuni had moved to Osaka on the mainland, to become a full-time karate instructor of a style he originally called Hanko-ryū, or "half-hard style". The name of the style changed to Shitō-ryū, in honor of its main influences. Mabuni derived the name for his new style from the first kanji character from the names of his two primary teachers, Higa(shi)onna and I(to)su. With the support of Ryusho Sakagami (1915–1993), he opened a number of Shitō-ryū dojo in the Osaka area, including one at Kansai University and the Japan Karatedō-kai dojo. To this day, the largest contingent of Shitō-ryū practitioners in Japan is centered in the Osaka area. Mabuni published a number of books on the subject and continued to systematize the instruction method. In his latter years, he developed a number of formal kata, such as Aoyagi, for example, which was designed specifically for women's self-defense. Perhaps more than any other master in the last century, Mabuni was steeped in the traditions and history of Karate-dō, yet forward thinking enough to realize that it could spread throughout the world. To this day, Shitō-ryū recognizes the influences of Itosu and Higaonna: the kata syllabus of Shitō-ryū is still often listed in such a way as to show the two lineages. Kenwa Mabuni died on May 23, 1952, and the lineage of the style was disputed between his two sons, Kenzō and Kenei. Currently, the Shitō-ryū International Karate-dō Kai (also known as Seito Shitō-ryū) lists Kenzō Mabuni as the second Sōke of Shitō-ryū, while the World Shitō-ryū Karate-dō Federation (also known as Shitō-kai Shitō-ryū) lists Kenei Mabuni. 落花 (rakka, "falling petals"). The art of blocking with such force and precision as to completely destroy the opponent's attacking motion. Examples of rakka are the most well-known blocks, such as gedan-barai (下段払い) or soto-uke (外受け). 流水 (ryūsui, "running water"). The art of flowing around the attacker's motion, and through it, soft blocking. Examples are nagashi-uke (流し受け) and osae-uke (押さえ受け). 屈伸 (kusshin, "elasticity"). This is the art of bouncing back, storing energy while recoiling from the opponent's attack, changing or lowering stance only to immediately unwind and counterattack. Classic examples are stance transitions zenkutsu (前屈立ち) to kōkutsu (後屈立ち) and moto-dachi (基立ち) to nekoashi-dachi (猫足立ち). 転位 (ten'i, "transposition"). Ten'i is the utilization of all eight directions of movement, most importantly stepping away from the line of attack. 反撃 (hangeki, "counterattack"). A hangeki defense is an attack which at the same time deflects the opponent's attack before it can reach the defender. Examples of this are various kinds of tsuki-uke (突き受け), including yama-tsuki (山突き). Modern Shitō-ryū styles also place a strong emphasis on sparring. Shitō-ryū stresses speed, and fighting is generally initiated from a higher, more upright stance than Shotokan employs. On the other hand, because the style has so many kata, a great deal of time is spent perfecting any one of its 40 to 60 forms. List of techniques, used in Shitō-ryū style of Karate. Blocks, kicks and strikes can be jōdan, chūdan or gedan and related to migi (right) or hidari (left). Heisoku dachi: Toes & heels together, (closed foot stance), at "attention". Musubi dachi: Heels together, & toes apart, (open foot stance) "knot" shape. Heiko dachi: Feet apart, parallel (open, hip width). Hachiji dachi: Feet apart, toes pointing OUT at 45 degrees (open, shoulder width). Uchi-Hachiji dachi (Niafanchi Dachi): Feet apart, toes pointing IN at 45 degrees (open, shoulder width). Shiko dachi: Straddle leg, "Sumo" stance. Zenkutsu dachi: Front knee bent, long forward stance. Nekoashi dachi: "Cat foot" stance. Renoji dachi: Stance resembling the letter "L". 'Tee'-ji dachi: Stance resembling the letter "T" upside down. Kosa dachi: "Hooked leg" stance. Sagiashi dachi: "Heron foot" stance (one-legged). Ukiashi dachi: Stance resembling Nekoashi dachi, but more upright in a loose floating leg stance. Gedan barai uke (Hari uke): Low-level, downward block / sweeping block. Yoko uke (Soto uke): Block from inside (centre of body), towards outside. Yoko uchi (Uchi uke): Block from outside, towards inside (centre of body). Age uke: Rising, upper-level block. Yoko Barai uke: Side, sweeping block. Uchi Otoshi uke: Circular, inside drop (downward pushing) block. Tsuki uke: Simultaneous punching (forearm) block. Te Kubi Sasae uke: Augmented (supported) wrist block. Kosa uke: "X" block (wrists crossed). Hijisasae uke: Augmented (inside-middle) elbow block. Osae uke: Pressing down block. Nagashi uke: Cross-body open-hand flowing/sweeping block. Shiuko uke (Haishu Uke): Open-hand, back-hand block. Shotei uke (Teisho): Palm-heel block. Seiken tsuki: Fore fist, straight punch (for basic practice). Gyaku tsuki: Reverse hand punch. Furi tsuki: Circular/swinging (roundhouse) punch. Mae Te tsuki: Lead-hand (forward hand) jab-punch. Ura tsuki: Inverted (palm up), close punch. Tate tsuki: Vertical fist punch. Shuto uchi: "Knife" (chopping) hand strike. Ura uchi: Back fist punch. Kentsui uchi: Bottom fist strike. Shotei (Teisho) uchi: Palm-heel strike. Haishu uchi: Open back-hand strike. Hiji ate uchi: Elbow strike. Koken uchi: Bent wrist-hand strike. Mae geri: Front (forward & return) kick. Oi geri: Stepping (lunging forward) kick. Yoko sokuto geri: Side (edge of foot) kick. Mawashi geri: Roundhouse kick (to front). Gyaku (Uchi) Mawashi geri: Reverse direction (inside) roundhouse kick. Ura Mawashi geri: Back leg, hook kick to front (heel/ball of foot). Ushiro geri: Straight-back (backward) kick. Ushiro Mawashi geri: Spinning, back-roundhouse kick to front. Mae-ashi geri: Forward leg, front kick. Hiza geri: Knee cap kick. Ushiro-ura-mawashi geri: Spinning-back, roundhouse kick. Gyaku (Uchi) geri: Reverse (inside) roundhouse kick. Mae-tobi geri: Front (jumping/flying) kick. Yoko-tobi geri: Side (jumping/flying) kick.